There is a new one minute Scott Shaw Zen Filmmaking Trailer up at YouTube. Click on the link to check it out. 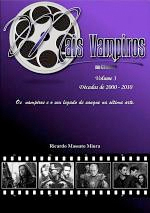 There is a great three volume book collection, presented in Portuguese, that has been released titled, Mais Vampiros No Cinema. This series discusses Vampire Cinema. In Volume Two, covering the years 1980 to 1990 and Volume Three covering the years 2000 to 2010 the author, Ricardo Massato Miura, details the Vampire Based Zen Films created by Scott Shaw along with a lot of other great films. The Book Series is available via eBooks on Google Play or in bound editions from the publisher in Brazil.